I sometimes see researchers who announce the submission of a paper to a conference on social networks, often tagging the post with the conference name and year, and from time to time mentioning the format and the topic of the paper. Does that violate the double-blind review, as through these networks reviewers can see the names of some submitting authors? In the example case, I'd say no. 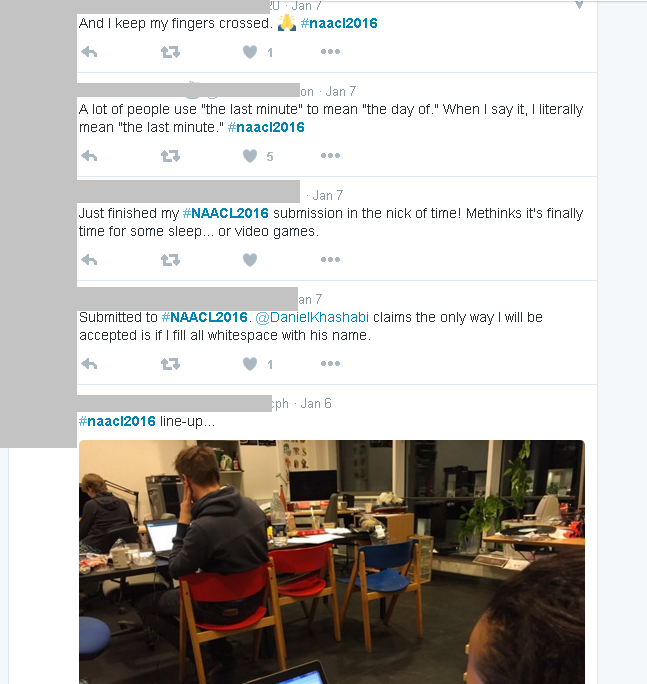 These Twitter posts fail to connect the Twitter user name (which isn't necessarily traceable to a specific human publicly, anyway) to the NAACL2016 submission. There is no title or submission numbers here and only one reference to a sub-specialty ("morphology") and a length ("long"). It'd be hard for a reviewer to break the blinding based just on that. Also, the whole point of double-blind review is to reduce the (hopefully) unconscious bias against underrepresented groups through connecting names to gender, race, national origin, etc, and the unconscious bias in favor of well-represented, well-known luminaries in the field. A reviewer who breaks the blinding on purpose is working against this purpose and should be summarily dropped by the Program Chair from the Program Committee if discovered. Unless you think you're a big name with a mediocre paper, it's rarely going to be worth trying to use alternative means to make it easy to unblind the paper. Everyone seems to agree that enough Googling is enough for any bright reviewer to unblind almost any paper they want (even though they shouldn't be trying). I don't think there's much of a concern in cases like this. I'd be more concerned if someone with a lot of followers and an open Twitter pseudonym tweeted that they had just submitted paper "1234!" to NAACL2016. Not the answer you're looking for? Browse other questions tagged ethics peer-review paper-submission social-media or ask your own question. Why do some conferences with double blind review ask for author names when submitting the paper for review? Double blind review: anonymise data source? I left the acknowledgment part in a double blind review paper submission, what can i do?